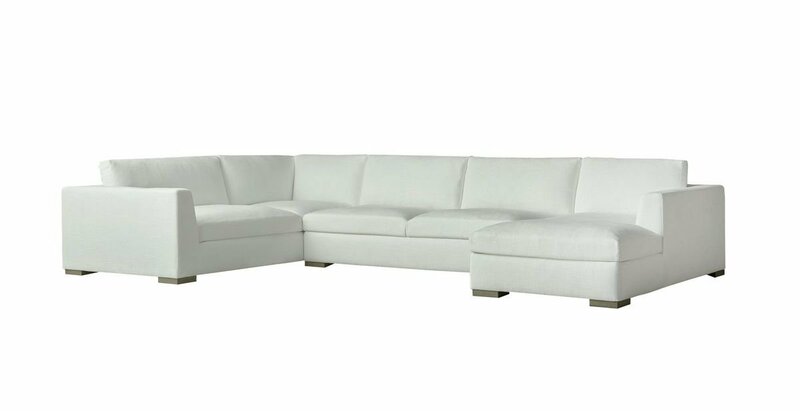 Restoration Hardware inspired, Bella U sectional combines 1930's Deco frame, Transitional taper arms, and modern extra wide seat cushions and back pillows to create its unique contemporary look. Modern, comfortable, and casual, it can easily be dressed up or down with chick fabric or throw pillows. 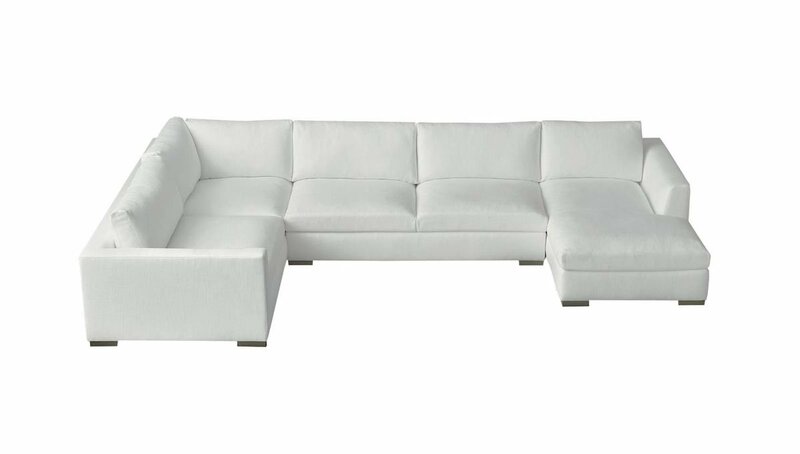 Bella U sectional can be ordered as slipcovered, upholstered with a skirt, in custom size, as a sectional in twenty-four configurations, as a sleeper, choice of seat cushion fill and firmness, leg style, and fabric. Please submit Request Custom Quote Form for custom pricing and special requests. If you have a difficult area to design for, want to go COM, or just want an exclusive, different design, please, call Customer Service (214) 984-4128. 8 Gauge sinuous spring suspensions or 8-Way handtied. Made with highest density foam to offer the perfect balance of softness and support. foam is CertiPUR-US approved, meaning the foam is manufactured without ozone depleters, PBDE flame retardants, mercury lead or other heavy metals, formaldehyde or phthalates. They are very low in VOC (Volatile Organic Compound) emissions indoor air quality (less than 0.5 ppm). Made in USA. Upholstered for well tailored look. Seat cushions in a choice of Standard 100% Polyester fill wrapped around foam core, 100% Polyester wrapped around upgraded 3.0 sag resistant foam core, Trillium (hypoallergenic down like fill), or 10/90 down feather-wrapped foam core fill (feathers wrapped around a soft foam core). Down Feather seating, unlike Trillium or foam core cushions, requires occasional “fluffing” to restore the down’s natural loft. 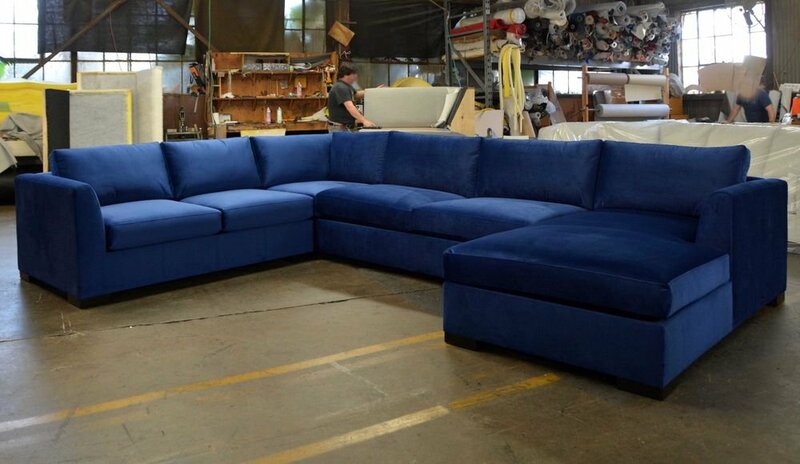 Coordinating back cushions are all Polyester for standard fill, 100% Trillium, or 10/90 blend of down and feather. Seat cushions and back pillows are reversible with fully removable covers and available in a range of fabrics and colors. Can be made with a Queen, Queen XL, or Twin size sleeper. Professional upholstery cleaning is recommended. Note that fabric dye lots might vary; pieces purchased at different times may not match exactly. Shipping: Can be shipped anywhere in the USA and Canada. Please, contact customer service for international shipping rates. We offer a wide variety of seat cushion options and choice of comfort levels, from standard 1.8 density sandwich contructed seats to the finest 3.0 density HR lifetime warranted foam for the ultimate in comfort and durability. Each core is double wrapped with a "premium luxe" soft feel polyester fiber for added comfort and crown. Our optional, Premium Seat Cushion , uses the foam core of your choice, but instead of the bonded polyester fiber wrap, we use a channel sewn, downproof muslin cover that surrounds each core. Each channel is filled with your choice of a blend of 10/90 white goose down and feather, or, you may opt for "Trillium", a specialized fiber that mimics the loft and feel of natural down without the issues of allergies and frequent fluffing. Our standard back pillow fill is a premium polyester fiber for softness and superior resiliency. Optional filling of "10/90 Downblend" or "Trillium" (synthetic down alternative) are also available. The fill is added to each channel to prevent shifting or sagging. For added support and structure, we offer back pillows with a foam core inside the channeled casing (Only back pillows with "boxed band" styling are available with a foam core). 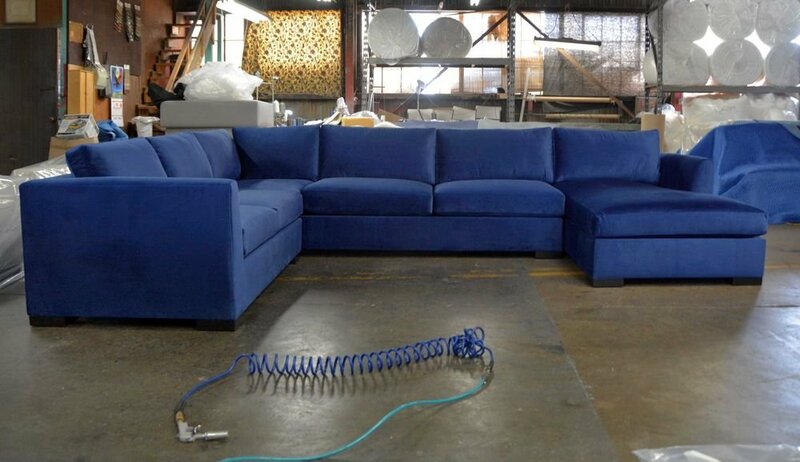 * All cushions require regular maintenance to maintain appearance. Visit cushion and pillow care for more detailed information. You can chose between standard ?” Welt Cord e.g. piping, 1/8” Welt Cord and Top Stitch for clean modern look. Premium Flanged Seam – available on either seats or pillows. Premium Double Stitch - for clean modern look. Our standard no Sag 8 Gauge Steel Springs are very durable and come with lifetime warranty. 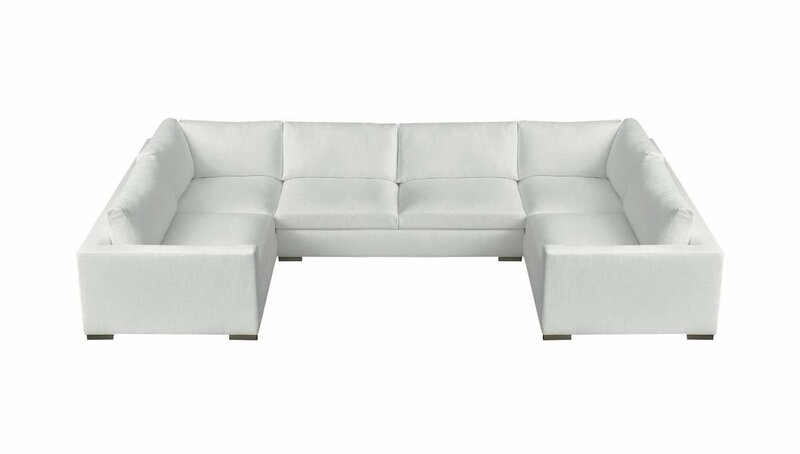 Optional Construction – provides level seat deck for modern styling, thin cushions, and no crown application. 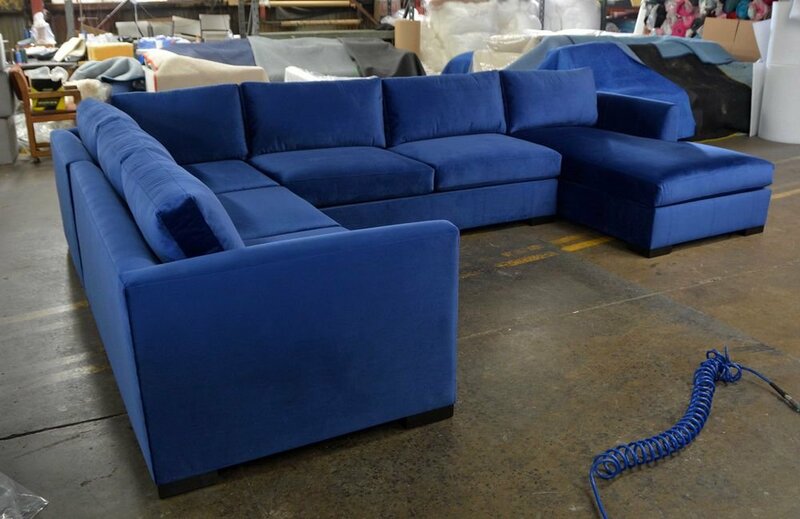 All our sofas come with standard wood legs. Chose between tapered square, cylinder, tapered block, and bun foot legs. Metal legs are available in brushed or chrome finish. Choose between three styles, S1, S2, and S3 in either brushed or chrome finish. At the Your Space Furniture, we offer a variety of nail trim options. All nails come in many finishes and sizes to achieve desirable look. Similar to a medium luxury memory foam mattress feel. Air Dream Sofa Sleep System comforts & supports like a premium luxury bed! Air Dream's core comfort element is engineered to provide the maximum in luxurious sleeping and rugged durability. Sleep sofa mattresses have never been this plush.10 inches of pure comfort offers the same plush dimensions and luxury feel as premium mattresses. Patented technology combines spring coil support with comfort of cushioning layer of air. Comfort level can be customized from orthopedic firm to plush firm easily and within seconds. Air dream distributes body weight evenly for ideal ergonomic support. Thank You! your request has been submitted. Please, allow 24 hours for our customer care representative to get back to you.